I know it's technically not Tuesday, but this outfit showed off some great sales that will be gone by tomorrow so I had to post it today! Anyway, this is a go-to travel look for me. Simple shoes, comfortable leggings, a large top and convertible jacket (you can unzip the inside lining to make it more lightweight). Traveling is all about being comfortable yet stylish (unless you're flying at 6 am -- ain't no body got time for that). These mixed media moto leggings are seriously my new best friend. They come in grey and black and are SO comfortable as well as warm! I love the detailing around the knee (hard to see in my pictures but you can check it out here) and the little touch of leather around the shins. It's the perfect go-to legging for any occasion, not just traveling. Love the comfy feel - important for traveling! Absolutely love the simple and chicness of this! Those leggings are perfect! Love this look, Krista! It's fantastic and a perfect travel outfit. 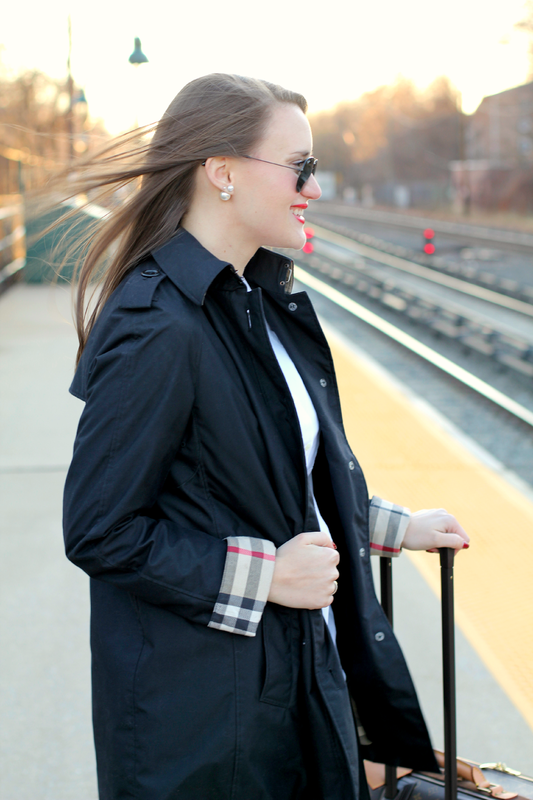 The perfect outfit for traveling! Love the double stud earrings! This looks like such a comfy travel outfit! And gotta love LV luggage, so classic.